​The focus of Women in Construction (WIC) Week is to highlight women as a visible component of the construction industry. 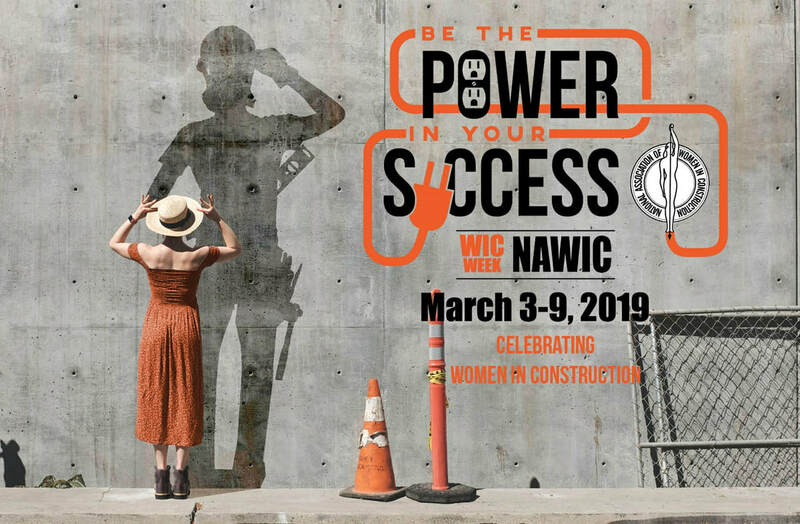 WIC Week also provides an occasion for NAWIC’s thousands of members across the country to raise awareness of the opportunities available for women in the construction industry and to emphasize the growing role of women in the industry. It is also a time for local chapters to give back to their communities. ​Let's share our activities, pictures, videos and successes here for the Region to celebrate! ​Let's flood Facebook with this awesome frame created by our very own Tania Bowman, MWR WIC Week Chair! ​Click on the arrow below or the image at the right to change your Facebook Profile and proudly show your support of Women In Construction! Activities Planned in the Midwest Region. ​A few of the local chapters are planning to get together to celebrate WIC Week with a kick off brunch on Sunday, March 3 in Rocheport, MO! ​This annual event is sponsored by St. Louis Chapter #38 and everyone is welcome to attend! Click on the image at right for details. RSVP by Thursday, Feb. 28 to Sandra Carter! ​Please let us know of any activities you have planned that are open to the public, other chapters, etc. We will share them here! Click Here to See What Chapters in the Midwest Region Have Planned! When you submit your WIC Week recap online, WHICH IS DUE APRIL 2nd) be sure to include the category (ies) you want to be judged in. The chapter or Region with the best score in the category will be announced at Annual Conference in Atlanta in 2019. Prizes will be a donation to the chapter or region general fund! Social Media Prize-Winners: Your chapter swarmed as a team and went the extra mile to spread the buzz online about women in construction! Blue-Ribbon Wearing PR Specialists: We know it takes time to get in the news, but your chapter didn’t shy away from yelling from the rooftops about WIC Week! Prize-Winning Networkers: Your chapter created multiple events, and then followed through and attended in droves to spread the word about WIC Week! Each chapter in our region has done some outstanding events during WIC Week in the past. Here is a compilation of suggestions that might help you finalize a few new things for 2019! They are always looking for content….submit press releases and letters to editor, articles about your chapter and what you’re doing, etc. Get them from national, or print off a copy and post them in all trailers, offices, schools, and around town! Just ask – it can never hurt. Submit a story idea and you might just get on the air….for free!